While there are lots of books on how financial creditors can recover their dues, there is a dearth of content detailing recovery of dues by operational creditors. This book is an attempt to show how this set of creditors can approach legal forums and why they should take the help of legal professionals on a regular basis not only to conduct financial due diligence, but also, in the case of default on payments, how to strategies their legal efforts to make the recovery in the most effective and cost efficient manner. 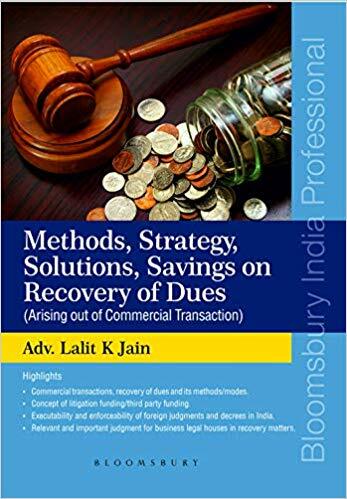 This book mainly covers the various methods of recovering the dues arising out of Commercial and Non-Commercial Transactions. The book would be immensely useful for Litigation Lawyers, In-House Legal Departments, Law Students and Finance professionals such as Chartered Accountants & Management Consultants. Key Features: Commercial transactions, recovery of dues and its methods/modes. – Pre-litigation strategy to be adopted by business entities. – Processing of summary suit and whether it is beneficial? – Proceedings under section 138 of Negotiable Instrument Act, 1881 a criminal offence. – Regular civil suit/civil suit proceedings. – Proceedings under the commercial courts, commercial division and commercial appellate division of High Courts Act, 2015. – How arbitration/meditation/ conciliation method help business entities save money? – Is MSME (statutory arbitration) relevant to business organisation from legal perspective? – Contractual arbitration vs statutory arbitration (MSME). – Insolvency under Insolvency and Bankruptcy Code, 2016 read with winding up under Companies Act, 2013. – Private criminal case under the Criminal Procedure Code. – Concept of Lok Adalat. – How to ensure that amount claimed via legal route is undisputed? – Making recovery of dues an easy process and why litigation happens and how to avoid. Concept of litigation funding/third party funding. Executability and enforceability of foreign judgments and decrees in India. Relevant and important judgment for business legal houses in recovery matters.